Please type your desired tags, e.g. Inorganic, Immunology, Cancer Metabolism, MRI, Pathobiology, Medical Rhetoric, STEM Writing, Grant Writing, renewable energy, American and British Women’s Literature, Communication, Public Adminstration, Early American Literature, Twentieth-Century American Literature, Eighteenth century French intellectual and literary history, and etc. Manufacturing on the nanoscale has come a long way since Feynman’s visions of nanotechnology more than 50 years ago. Since then, studies have demonstrated how low-dimensional structures, such as nanowires and quantum dots, have unique properties that can improve the performance of a variety of devices. In the latest study in this area, researchers have fabricated transistors made with exceptionally thin silicon nanowires that exhibit high performance due to quantum confinement effects in the nanowires. 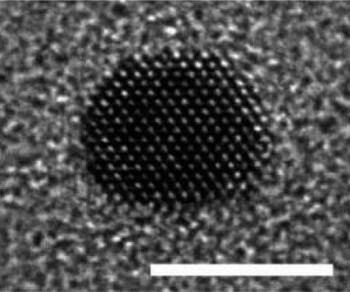 The team of researchers, Krutarth Trivedi, Hyungsang Yuk, Herman Carlo Floresca, Moon J. Kim, and Walter Hu, from the University of Texas at Dallas, has published their study in a recent issue of Nano Letters. UT Dallas is the new home of a consortium dedicated to making technological advances in the silicon wafer that is the foundation for most of the semiconductor chips that surround us. “This is a great opportunity to further enhance our faculty members’ and graduate students’ impact on the future development of semiconductor technology,” said Moon Kim, director of the center and a professor of materials science and engineering. The field is a fast-growing area at the University that now includes 14 faculty members, dozens of graduate students and several million dollars in annual research funding. 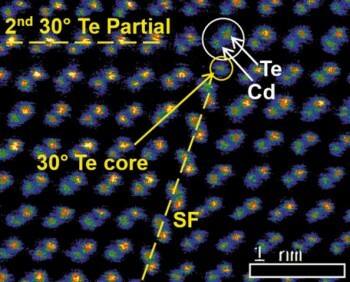 Crystallographic defects or irregularities (known as dislocations) are often found within crystalline materials. Two main types of dislocation exist: edge and screw type. However, dislocations found in real materials tend to be a mix of these two types, resulting in a complex atomic arrangement not found in bulk crystals. The study of these dislocations in semiconductors is probably as old as the science of semiconductors itself, and the technological importance of dislocations can hardly be overstated. The field of quantum mechanics deals with materials at atomic dimensions, and big discoveries often happen at a very small scale. Researchers in the Erik Jonsson School of Engineering and Computer Science, in collaboration with an international team of engineers and scientists, have uncovered a phenomenon that could have major implications for the development of nano-electronic circuits and devices. In a recent article published in Nature Communications, the researchers describe for the first time how grown and stacked, atomically thin materials can exhibit a unique transport effect, called negative differential resistance, or NDR, at room temperature. In the quest for faster and more powerful computers and consumer electronics, big advances come in small packages. The high-performance, silicon-based transistors that control today’s electronic devices have been getting smaller and smaller, allowing those devices to perform faster while consuming less power. But even silicon has its limits, so researchers at The University of Texas at Dallas and elsewhere are looking for better-performing alternatives. Expertise in high resolution analytical electron microscopy includes HREM phase contrast and STEM Z-contrast imaging, Convergent Beam Electron Diffraction (CBED), energy dispersive x-ray (EDX) and electron energy loss spectroscopy (EELS). Served as a lab instructor and a committee member of User Program of the National Facility for HREM at ASU for more than 10 years during his tenure at Arizona State University, conducted extensive interdisciplinary collaborative research involving state-of-the-art TEM nano-characterization. Nanofactory Instruments AB, Sweden: Recruited to open its U.S. headquarter in Richardson. Established a strategic partnership for the development of new instruments (e.g., in-situ STM-TEM, AFM-TEM and TEM-nanoindentation tools) and collaborative research. Japan Electro-Optics Lab (JEOL), Inc. - UTD as its U.S. Southwest Demo Center. Directing the NSF initiated Silicon Wafer Engineering and Defect Science (SiWEDS) Center. Its industry and academic members are: SRC, MEMC, Samsung, Hynix, Siltronic, UTD, NCSU, UoW, Stanford, MIT, Waseda Univ., ASU. Served as a reviewer for the following journals: Metallurgical Transactions, Ultramicroscopy, Journal of Electronic Materials, Journal of Applied Physics, Sensors and Actuators, Journal of Materials Science, International Journal of Nanoscience, Microelectronic Engineering, Composite Science and Engineering, Thin Solid Films, ACS Nano, Acta Materialia, Energy and Fuels, Microscopy and Microanalysis, IEEE Transactions on Nanoelectronics, IEEE Electron Device Letters, Environmental Science and Technology, Journal of The Electrochemical Society, and Journal of Nanoengineering and Nanosystems. Gave over 85 invited lectures and seminars at National/International conferences, Universities and Research Institutes. Taught annually at the internationally renownedASU Winter School for HREM(2002-2009). K-12 outreach program (Provided hands-on experience by visiting RISD elementary schools with lab equipment - "Men in Nano" theme). Designed and built an ultra high vacuum (UHV) wafer bonding unit to integrate dissimilar materials suitable for electronic and optical properties measurements, fracture mechanical testing, and structural characterization by electron microscopy. 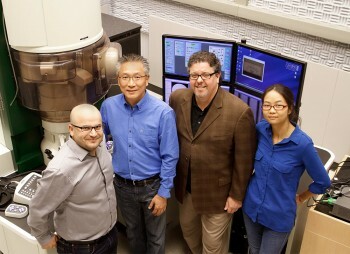 There are only two other similar instruments in the world: at Lawrence Livermore National Laboratory and the University of Tokyo Dr. Kim's unit is the one capable of synthesizing planar interfaces (for metals, ceramics and semiconductors) suitable for both microscopy and quantitative interface strength measurements with both control of interface orientation and additional element chemistry.